Anatomic Studies on Verbascum pestalozzae Boiss. and Verbascum pycnostachyum Boiss. & Heldr. The genus Verbascum L. (Scrophulariaceae) known as “sığır kuyruğu” in Anatolia is represented by 248 species, 193 of which are endemic. The flowers contain essential oil, mucilage, and glycosides. Some species of Verbascum have some folkloric uses as expectorants, sedatives, and treatment for dysmenorrhea and rheumatalgia. Its use for healing wounds in animal care has also been reported. 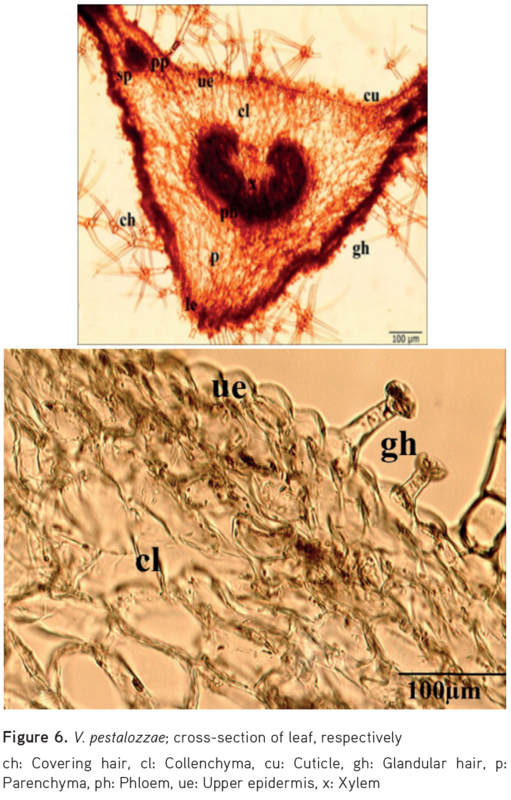 In this study, the anatomic structures of root, stem, and leaves of Verbascum pestalozzae Boiss. and Verbascum pycnostachyum Boiss. & Heldr. are given for the first time. 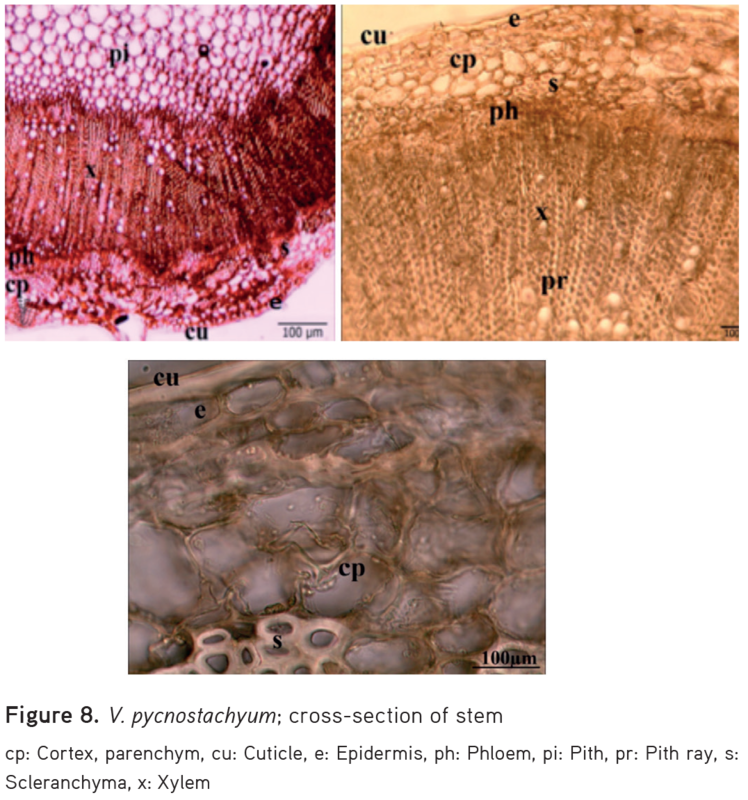 According to the results, some of the differences between stem and leaf anatomic features of these species were described and the data were supported by detailed photographs. Specimens were collected from C3 Antalya: Voucher specimens of V. pestalozzae and V. pycnostachyum were deposited in the Herbarium of the Biology Department, Akdeniz University in Antalya, Turkey and Herbarium of the Faculty of Pharmacy, Anadolu University in Eskişehir, Turkey. 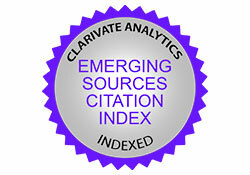 The materials were identified as V. pestalozzae and V. pycnostachyum using flora of Turkey and the East Aegean islands. For anatomic studies, samples were collected from the natural habitats and kept in 70% alcohol. In the research, root, stem and leaves of mature and flowered plants were used. Investigations were performed on the cross-sections of the root, the flowering stem, and the leaf. The anatomic structures of the species were drawn using a Leitz SM-LUX binocular microscope. All sections were embedded in glycerin gelatin and stained using Sartur reactive, and photographs were taken through a light microscope (Olympus BX51T). 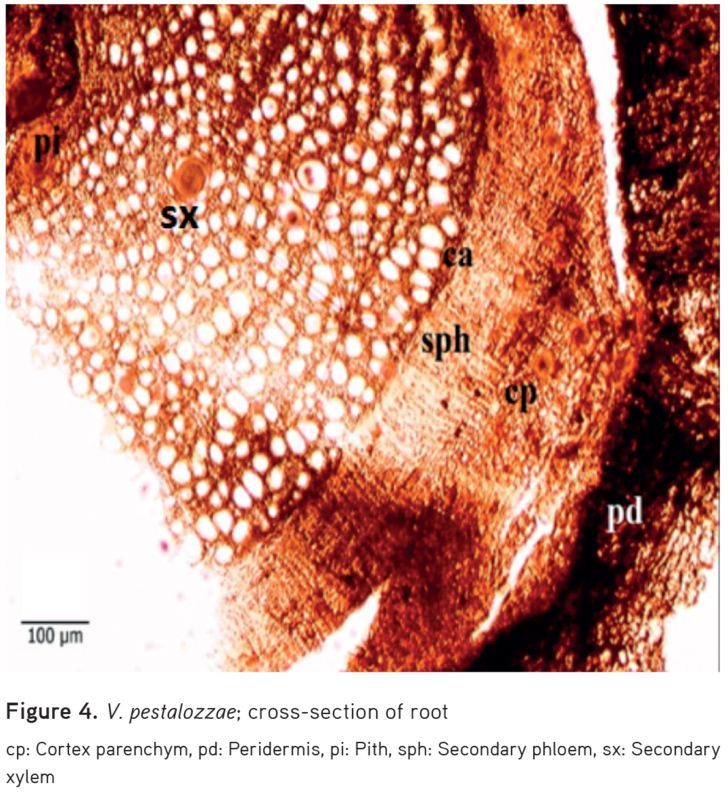 The cross sections taken from root, stem, and leaves of V. pestalozzae and V. pycnostachyum were examined and the anatomic features belonging to these plants were determined and compared. The anatomic properties belonging to the two species were generally compatible with findings of Metcalfe and Chalk and others signified in the genus. We believe that our results provide additional evidence for taxonomists to help separate the species. The lack of a taxonomic, morphologic, and anatomic study on the species made it important for the systematic introduction of the research. Verbascum species have some folkloric uses such as a sedative, and treatment for dysmenorrhea and rheumatalgia. Its use for healing wounds has also been reported in animal care. Iridoid and neolignan type glycosides, oleanan type terpenes, flavonoids, polysaccharides, saponins, steroids and alkaloids were major compounds isolated from Verbascum species.11 In several bioactivity studies on Verbascum sp., anti-proliferative,12 anti-inflammatory,13 antioxidant,14,15 anti-histaminic, anti-fungal, anti-bacterial,16 wound healing,17 anti-microbial18 and anti-cancer effects19 have been shown in crude extracts of roots, leaves, flowers, and aerial parts. Verbascum genus is one of the largest genus with regard to the number of species in Turkey and is also known for several problems in diagnosis and taxonomy. In addition, the anatomic structures of root, stem and leaves of and Verbascum pestalozzae Boiss. (endemic), “Boz Sığır Kuyruğu’’ and Verbascum pycnostachyum Boiss. & Heldr. “Eğirdir Sığır Kuyruğu’’2,4 are given in this study for the first time. For anatomic studies, samples were collected from the natural habitats and kept in 70% alcohol. In the research, root, stem, and leaves of mature and flowered plants were used. Investigations were performed on the cross-sections of the root, the flowering stem, and the leaf. The anatomic structures of glandular and covering hairs were drawn using a Leitz SM-LUX binocular microscope. All sections were embedded in glycerin gelatin and stained using Sartur reactive, and photographs were taken through a light microscope (Olympus BX51T). 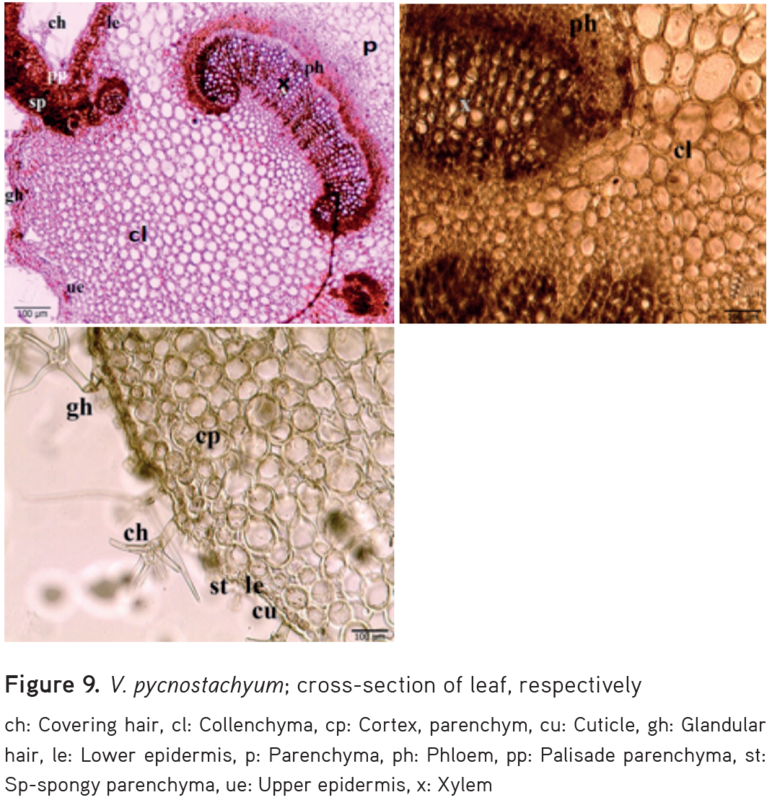 The cross sections taken from root, stem, and leaves of V. pestalozzae and V. pycnostachyum were examined and the anatomic features belonging to these plants were determined and compared (Figures 4, 5, 6, 7, 8, 9, 10, Table 1). The root in both species is composed of periderm on the outside and felloderm where 4-5 radial rows are broken down and felloderm with 2-3 rows of tissue. Outer felloderm cells are tissue debris of the primary cortex that has been shattered or crushed in place. Secondary phloem formed of elliptical-shapeless, round-shaped, irregular-arranged and 4-6 row cells under the periderm is taken part. Cambium is uncertain. The secondary xylem part covers a large area and consists of tracheal elements with large and small sizes in a sclerenchymatic tissue. Medullary rays are 2-3 rows of cells. 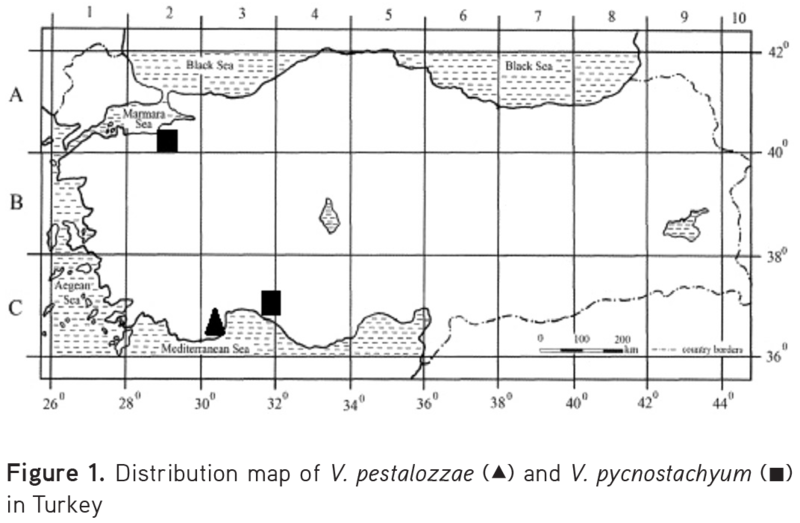 The pith region, covering a narrow area, is parenchymatic in V. pestalozzae and V. pycnostacyum (Figures 4, 7). When cross-sections were taken on the stems of two Verbascum species, secondary growth was observed. The epidermis is formed by a single-row, thick membrane elliptic or round cells. The upper and lower walls are thick but the lateral sides are thin. Its upper surface is covered with cuticle (Figures 5, 8). Covering hair and glandular trichomes were observed. Covering hairs of V. pestalozzae are candelabriform, stellate, and multicellular. Glandular trichomes were of 6 types; head 1 stalk 2 celled; head 2 stalk 1 celled; head 3 stalk 2 celled; head 1 stalk 3 celled; head 2 stalk 3 celled; pellucid glands (Figures 11b). Covering hairs are candelabriform, stellate, and multicellular in V. pycnostachyum. Its glandular trichomes are of three types; head 1 stalk 1 celled, head 2 stalk 1 celled, head 3 stalk 2 celled (dense, Figures 10). Parenchymatic cortex in 5 or 20 rows is found in both species under the epidermis. Collenchyma cells under the epidermis in the primary cortex were seen, and parenchyma cells including oval-shaped chloroplast inside the epidermis were found. Druse crystals were observed in parenchymatic cells. The endodermis, consisting of flattened cells, can hardly be distinguished from the cortex parenchyma. 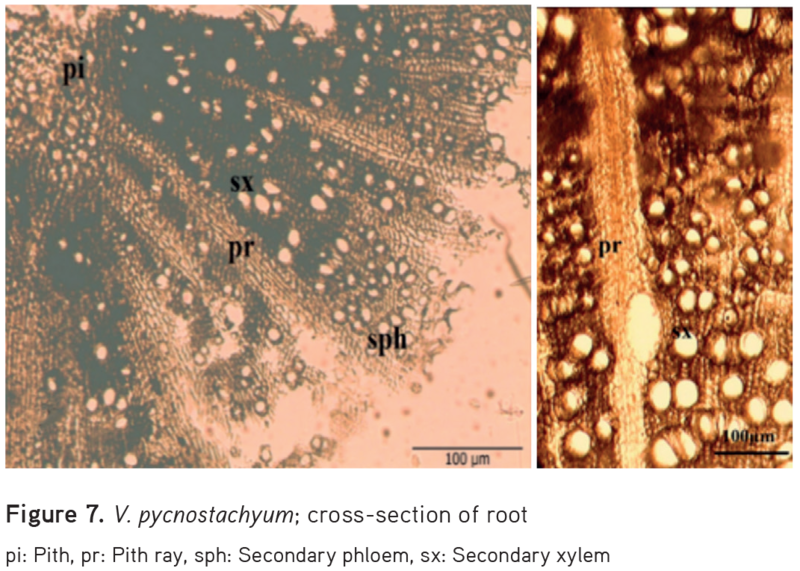 There were large, small, and discontinuous sclerenchyma bunches, 3 or 6 rows in secondary phloem of V. pestalozzae, but 1-5 rows in V. pycnostachyum. Phloem is much narrower in V. pestalozzae with 3-8 rows, but it is much wider in V. pycnostachyum with 8-15 rows, but has a circle shape consisting of flattened, shapeless or oval cells. Cambium is uncertain. Bunches in both types of secondary xylem narrowed towards the primary xylem. 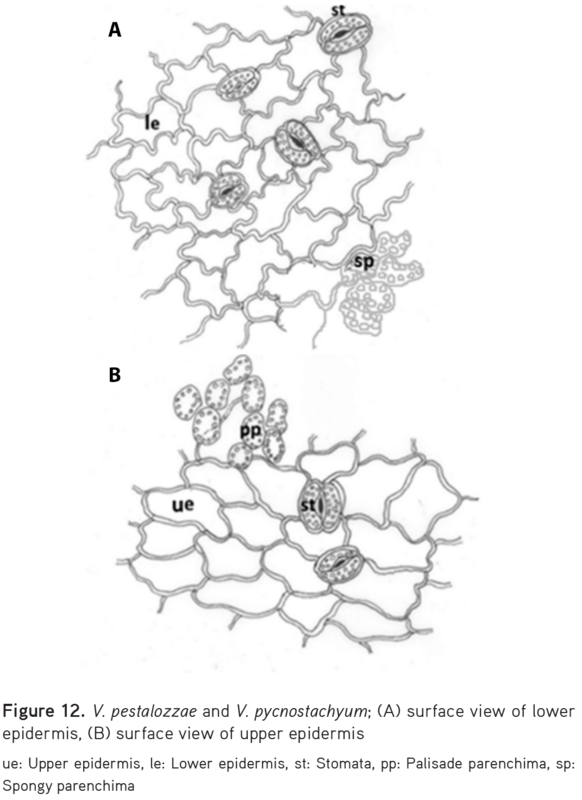 Sclerenchymatic cells in this part, formed from trache and tracheids in both types, created regular rows in a radial direction. Pith bunches were in the form of large polygon or round- shaped and parenchymatic cells where their walls were lignified. Druse crystals were clearly found in these cells (Figures 5, 8). In the cross-section of the main and inter vascular tissues, the outer and inner layers of V. pestalozzae and V. pycnostachyum were clearly protrusive. The epidermis includes a single flattened row, rectangular, round or oval-shaped cells. Outer epidermal cells are larger than the inner epidermal cells, covered with a thin cuticle layer, which is curled over. Outer membranes are thicker than inner and longitudinal membranes, but the inner membranes of epidermal cells in the middle vein area became thicker. Covering hairs and glandular hairs were the same as the stem and seen in both epidermis. Covering hairs are candelabriform, stellate, and multicellular in V. pestalozzae. Glandular hairs were of 6 types. The covering hairs of V. pycnostachyum were candelabriform, stellate, and multicellular. 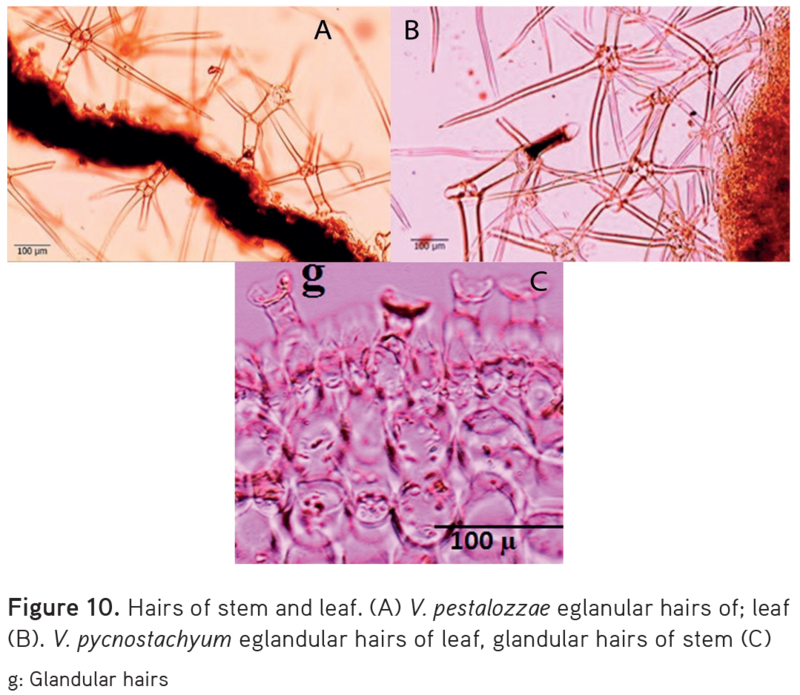 Glandular hairs were of 3 types. Stoma (amphistomatic) found on both surfaces of the leaf were much denser on the lower surface. The transverse cross-section is higher than the epidermal cells (hygromorphic stoma). In all types of mesophyll was arranged as two or three-rows under the outer epidermis. It was formed with plentiful chloroplasted palisade parenchyma and three or five rows of sponge parenchyma, which was underneath (bifacial leaf). Vascular bundles were collateral. These were well developed in a continuous crescent in V. pestalozzae but interrupted and horn-shaped in V. pycnostachyum. Xylem was located in the upper epidermis, while the floor was located in the lower epidermis. In xylem, tracheal elements are arranged radially and thin-walled parenchymal cells are present. Phloem is placed under the xylem. Clear parenchymatic cells were arranged in 2 or 3 rows under the outer epidermis, five or six rows in V. pestalozzae after collenchyma, and 5 or 6 rows in V. pycnostachyum. 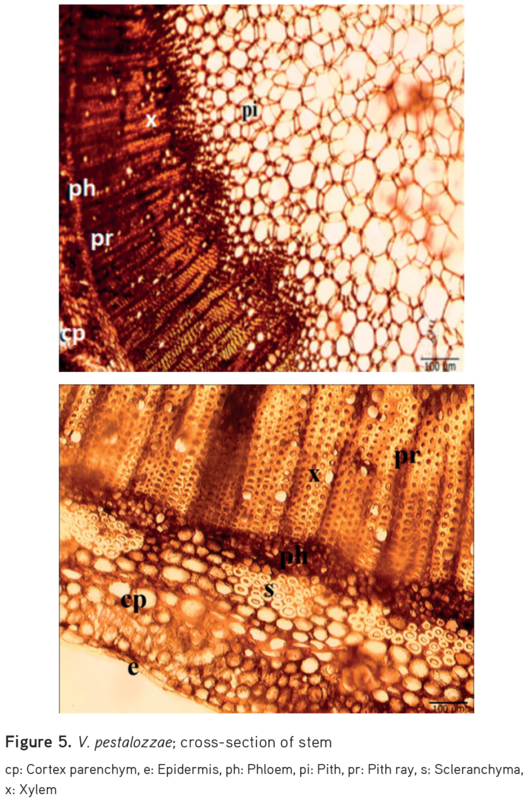 Parenchymatic tissue was found in V. pycnostachyum with 25-30 rows under the phloem till the inner epidermis, but much narrower in V. pestalozzae with 5-10 rows. Thick lateral veins in both sides of the middle vein were arranged till the edge of palm and the middle vein made a deep outgrowth. The lateral veins had the same anatomical structure as the middle veins, but vascularity was much more reduced (Figures 6, 9, 10, 11, 12). According to the results, the root, stem, and leaf anatomic structures of each Verbascum species, V. pestalozzae differs anatomically from each other. 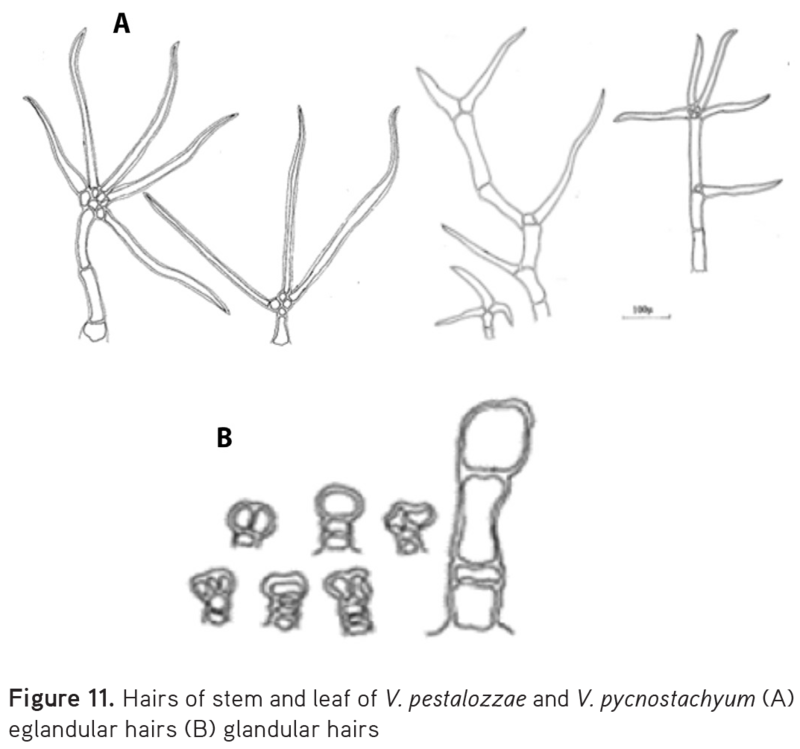 These differences can be summarized as follows: in the stem, there are narrower sclerenchymatic cells and phloem than those in the leaf of V. pestalozzae; having a protrusion below, continuous crescent vascular bundles, less parenchymatic cells in outer and inner epidermis, stellate type hairs and differences in the number of cells in secretion hairs. The anatomic properties belonging to the two species are generally compatible with the findings of Metcalfe and Chalk20 and others signified in the genus.21-24 We believe that our results provide additional evidence for taxonomists and can help to separate the species. The lack of a taxonomic, morphologic, and anatomic studies on the species made it important for the systematic introduction of the research. Çıngay, B, Karavelioğulları FA, A new species of Verbascum, V. nihatgoekyigitii (Scrophulariaceae), from southeastern Anatolia, Turkey. Phytotaxa. 2016;269:287-293. Huber-Morath A, Verbascum L. In: Davis PH, ed. Flora of Turkey and The East Aegean Islands, University Press; Edinburgh; 1978;6:453-603. Davis PH, Mill RR, Tan K. Flora of Turkey and The East Aegean Islands (Supplement), Vol.10, University Press; Edinburgh; 1988;(Suppl):190-192. Karavelioğulları FA, Verbascum L. İçinde: Güner A, Aslan S, Ekim T, Vural M, Babaç MT, eds. Türkiye Bitkileri Listesi (Damarlı Bitkiler). Nezahat Gökyiğit Botanik Bahçesi ve Flora Araştırmaları Derneği Yayını; İstanbul; 2012:850-870. Karavelioğulları FA, Yüce Babacan E, Başer B. Verbascum duzgunbabadagensis (Scrophulariaceae), a new species from eastern Anatolia, Turkey. Phytotaxa. 2014;181:47-53. 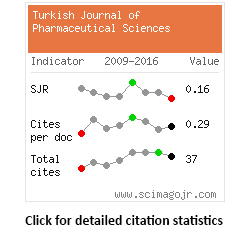 Şengül M, Ögütçü H, Adıgüzel A, Şahin F, Kara AA, Karaman İ, Güllüce M. Antimicrobial Effects of Verbascum georgicum Bentham Extract. Turk J Biol. 2005;2:105-110. Baytop T. Türkiye’de Bitkiler ile Tedavi, 2. Baskı, Nobel Tıp Kitabevleri; İstanbul; 1999:334-335. Tuzlacı E. Şifa Niyetine, Türkiye’nin Bitkisel Halk İlaçları. Alfa Yayınları; İstanbul; 2006:379-383. Senatore F, Rigano D, Formisano C, Grassia A, Basile A, Sorbo S. Phytogrowth-inhibitory and antibacterial activity of Verbascum sinuatum. Fitoterapia. 2007;78:244-247. Tatlı İİ, Schuhly W, Akdemir ZS. Secondary metabolites from bioactive methanolic extract of Verbascum pycnostachyum Boiss. & Heldr. flowers. H U J Fac Pharm. 2007;27:23-32. Turker AU, Camper ND. Biological Activity of Common Mullein, A Medicinal Plant, J Ethnopharmacol. 2002;82:117-125. 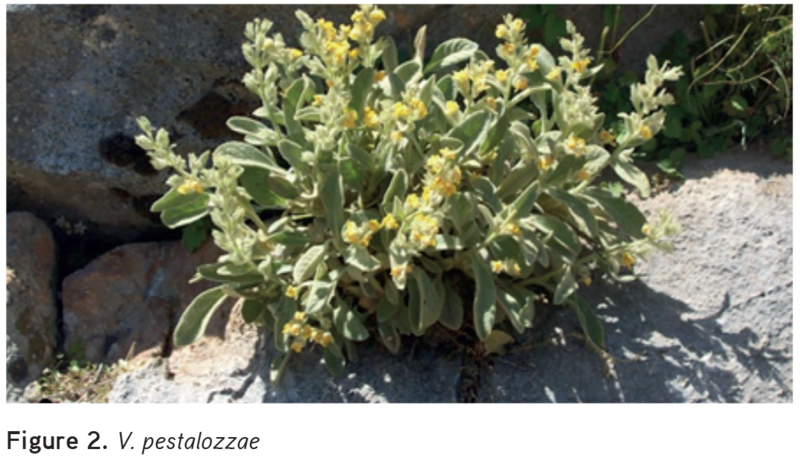 Klimek B, Stepien H. Effect of some constituents of mullein (Verbascum sp.) on proliferation of rat splenocytes in vitro. Eur J Pharm Sci. 1994;2:123. Lee JH, Lee JY, Kang HS, Jeong CH, Moon H, Whang WK, Kim CJ, Sim SS. The effect of acteoside on histamine release and arachidonic acid release in RBL-2H3 mast cells. Arch Pharm Res. 2006;29:508-513. Alan S, Saltan FZ, Göktürk RS, Sökmen MM. Taxonomical Properties of Three Verbascum L. Species and Their Antioxidant Activities. Asian J Chem. 2009;21:5438-5452. Quirantes-Piné R, Herranz-Lopez M, Funes L, Borrás-Linares I, Micol V, Segura-Carretero A, Fernández-Gutiérrez A. Phenylpropanoids and their metabolites are the major compounds responsible for blood-cell protection against oxidative stress after administration of Lippia citriodora in rats. Phytomedicine. 2013;20:1112-1118. Abougazar H, Bedir E, Khan, IA, Çaliş I. Wiedemannioside A-E: New Phenylethanoid Glycosides from the Roots of Verbascum wiedemannianum, Planta Med. 2003;69:814-819. Mehdinezhad B, Rezaei A, Mohajeri D, Ashrafi A, Asmarian S, Haghdost IS, Hokmabad RV, Safarmashaei S. Comparison of in vivo wound healing activity of Verbascum thapsus flower extract with zinc oxide on experimental wound model in rabbits. Adv Environ Biol. 2011;5:1501-1509. 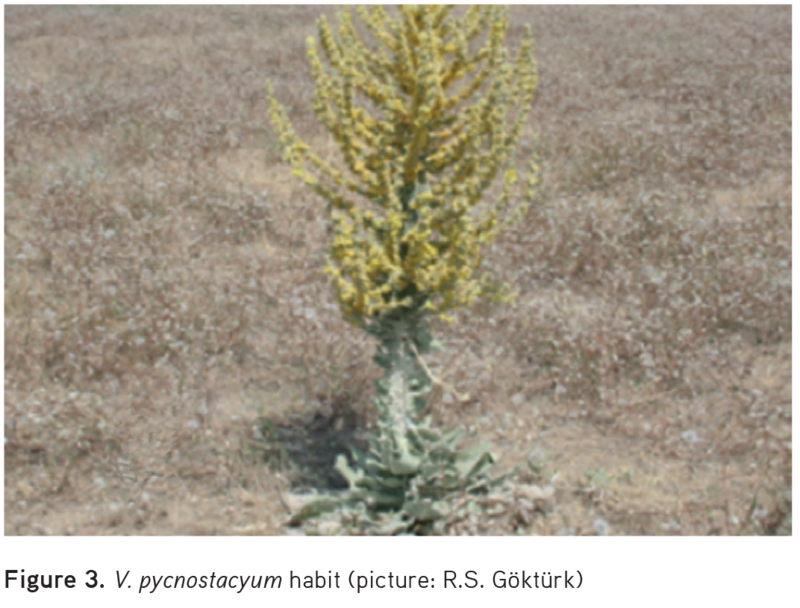 Dülger B, Kirmizi S, Arslan H, Güleryüz G. Antimicrobial activity of three endemic Verbascum species. Pharm Biol. 2002;40:587-589. Korkina LG, Pastore S, Dellambra E, De Luca C. New molecular and cellular targets for chemoprevention and treatment of skin tumors by plant polyphenols: a critical review. Curr Med Chem. 2013;20:852-868. Metcalfe GR, Chalk L. Anatomy of the Dicotyledons. London; Oxford Üniv Press; 1979. Coşkunçelebi K, İnceer H, Beyazoğlu O. Verbascum varians Freyn & Sint. var. trapezunticum Murb. (Scrophulariaceae)’un Morfolojik, Anatomik ve Sitolojik Yönden İncelenmesi. Ot Sistematik Botanik Derg. 1999;6:25-34. Çakır T, Bağcı E. Verbascum anatolicum (Fisch. & Mey) Hub-Mor. (Scrophulariaceae)‘a ait Taksonomik Karakterler Üzerinde Gözlemler. Fırat Üniv Fen ve Müh Bil Dergisi. 2005;17:151-153. Çakır T, Bağcı E. Verbascum euphraticum Bentham ve V. melitenense Boiss (Scrophulariaceae) Türleri Üzerinde Taksonomik Bir Çalışma. Fırat Üniv Fen ve Müh Bil Dergisi. 2006;18:445-458. Alan S, Gökman AB. Investigation of morphological, morphometric and anatomical characteristics of endemic Verbascum orgyale Boiss. & Heldr. Biological Diversity and Conservation. 2015;8:94-103.